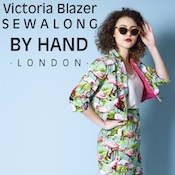 Home / Sew-alongs / Announcing the Victoria Blazer Sewalong! Announcing the Victoria Blazer Sewalong! It's Sewalong Time again girlies - Monday 8th July 2013 marks the official start of the Victoria Blazer Sewalong! This pattern is an absolute breeze to whip up, so nothing could be better for a spot of last minute Summer wardrobe sewing. For all of you "beginner" sewists out there who may have been a little wary of jumping in at the deep end with a jacket pattern, we'll be here to hold your hand every step of the way - answering questions, offering tips and showing you how beautifully simple the Victoria is to make. Being a casual blazer with a laid back attitude, she's been designed with plenty of ease so there's no tricky tailoring or fitting involved here. We absolutely can't wait to get started - we've picked out our fabrics already and are dying to see what you guys come up with! Speaking of which - check out Katy's awesome colour blocked Victoria (with matching shorts no less) at katyandlaney.com. We likey very much. First post goes up MONDAY 8th JULY, so if you haven't already, you still have time to get your pattern and supplies. We'll be publishing two-three posts per week, so hopefully we'll have ourselves some seriously fly blazers just in time for the Summer's shenanigans (or some cosy Autumnal layers for our friends in the Southern Hemisphere). We'll be making up one cropped variation with sleeves, and one sleeveless variation with pockets, thereby covering all aspects from all three variations. Really all you need to do to get involved is just sewalong with us! Obviously, we love nothing more than seeing your By Hand London creations, so if you'd like to share your progress with us and the world - sharing is caring after all - please feel free to post on your blogs, show some love on our Facebook page, tweet us or Instagram @byhandlondon using the hashtags #byhandlondon and #victoriasewalong, join our Pinterest community board or upload your pictures to our Flickr pool. How will the posts be broken down? I’m getting excited. What do I need? Fabric. You'll need about 2m of a 60" width fabric or 2.5m of a 45" width fabric for the main variation (full length with sleeves), and 1.5m (60") or 2m (45") for the cropped or sleeveless variations. For the lining, you'll need 1m of 60" width or 2m of 45" width. We've recommended light to medium weight fabrics with a bit of body - things like basic cotton, linen, chambray, wool crepe, flannel, soft denim, wool or tweed are ideal. Stable knits such as ponte or double knit would also be great. For the lining, we suggest you go for a buttery soft 100% cotton lawn or quilting cotton. Please make sure you pre-wash your fabric before cutting! Nothing worse than spending all that time making something beautiful only for it to shrink in the wash... Been there, folks. Never again. A couple of spools of matching thread - it's always a good idea to get this when you get your fabric (or bring a swatch of your fabric with you) to get a good colour match. You may need two colours if your shell and lining are contrasting. Various dressmaking supplies: a sewing machine, fabric scissors/rotary cutter, paper scissors, tracing paper, pens & pencils, pins, a hand sewing needle, a tape measure, tailor’s chalk, an iron. That’s about it for now… In the meantime, help us spread the word and grab the official Victoria Blazer sewalong badge! Simply save the image below onto your computer and attach the following link to the image in your blog layout. Clicking on it will swiftly take you and your readers to all the Victoria Blazer sewalong posts. So wonderful to hear that we inspired you to want to make the Victoria Blazer! But, yes, I’m afraid that we are out of stock at the minute, but will be back in stock in 4-6 weeks. We’ll be sure to shout about it loudly on our Facebook page, so do keep an eye out! wow..you guys really inspired me…but, it seems not in stock. Is there a way to get the pattern? Yikes, sorry for the duplicate, my phone is acting crazy! ooh can’t wait for this to start! Got all the fabric for a cropped version but think I could be tempted to make a longer version as well! I am SO excited about this! I’m dying to make this blazer, but it will be so much more fun with other people! Yay! I just got the pattern, this will motivate me to get one (or a couple!) made- excited!! Yay!! I just got this pattern and have been perusing my stash, there are 3 that I want to make already so this is the perfect motivation to do it!